Halo CE taunted us very early on when that games Elite's could strike us down with an energy sword but the Chief could never get his hands it. Fans wanted to use it and badly. Halo 2 let people have the chance to slice and dice their opponents and the Halo multiplayer universe hasn't been the same since. The sword can be a wonder weapon to use if you do it right. 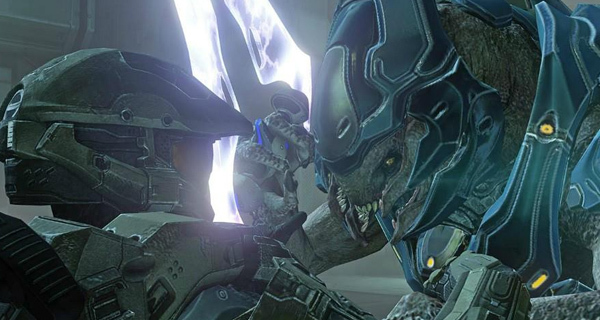 Here's some pro tips on how to successfully use the Halo 4 Covenant in multiplayer and rack up some nice kills. Players move faster with Sprint by default, they assume they can just run at opponents and kill them with the lunge from far away. This is a mistake, Halo multiplayer is a hotbed of any thing can happen. You still need to be ninja like with the sword. In close quarters and confined places it is your friend. Use it to blind side players in those tight spots and corners. When Boy Scouts go camping, they take a knife with them. Same can apply in Halo when camping, a sword in you back pocket can be quite useful. A sword lunge can be parried with a sword melee. If you deliver a melee successfully, you will then be able to lunge immediately after your melee, getting the jump on your attacker. In consideration of the above, the sword has an important change from the prior Halo games which allows to swing much faster than it has in the past which eliminates uwanted parries. This means you have to be on your game. Normally when sprinting with normal weapons, if an opponent shoot you, the shots will slow you down a tad. A sword wielding player is immune to this so there's an advantage to be exploited. Remember to key an eye on your sword's energy level - you don't want to be caught with uncharged sword as basically you'd be slapping your opposition with a feather duster. Originally published at Post Game Lobby.